With a new Labor government in power in Queensland, the future of some major projects is uncertain. However, this is not the case for the major Queens Wharf project, which has been given support from the new government. 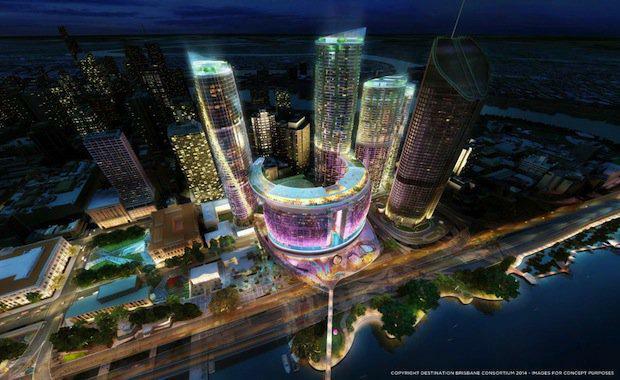 A letter from retiring state ALP Deputy Leader Tim Mulherin in the last days of the campaign indicated the party was in favour of the previous Newman government’s plan to redevelop the Brisbane CBD riverfront, which is an argument that had not been expressed previously. “Queensland Labor supports the redevelopment of Queen’s Wharf,” he said in the letter. “A Labor government would place the proposals for the Queen’s Wharf Integrated Resort Development through a proper and thorough departmental assessment and probity review. As reported by The Australian, senior public servants had completed their assessments of the high-stakes rival consortia bidding to build the casino resorts — Crown with the Chinese state-owned developer Greenland, versus Echo’s joint venture with Chow Tai Fook and the Far East Consortium — and were ready to hand their decision to a re-elected Newman government cabinet. However, with a new Labor government, the tender process is likely to be delayed and the assessment procedures for Queens Wharf are going to be reviewed in line with Labor policy. One factor at play is the influence of the United Voice union, which backed the Crown-led consortium last year and will be influential under a Labor government. Echo Entertainment chief executive Matt Bekier said last week that the company had spent $9 million on its bid so far and would work with either side of government.